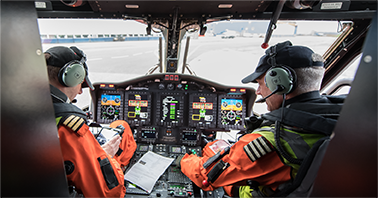 ABERDEEN – CHC Helicopter and Aberdeen University’s Department of Industrial Psychology have been awarded £54,000 to fund PhD Research projects in Crew Resource Management (CRM) and Human Factors training, commencing September 2019. The award, made by the Scottish Graduate School of Social Science (SGSSS) and the Economic and Social Research Council (ESRC), will see Dr. Amy Irwin and her team working with the CHC Flight Training Department in Aberdeen to study and develop the latest helicopter operations training methods and scientific evaluation techniques. Dr. Irwin explained: “CRM training and behaviours are a key element of helicopter flight safety. This project will enable key aspects of training, the factors that might influence training and CRM effectiveness, to be evaluated. The results should enable future training programmes to become even more effective. The collaboration with Aberdeen University will see this research develop in an exciting direction, integrating many principles of Applied Psychology with the practical knowledge the CHC EMEA team has acquired through decades of North Sea Helicopter Operations.